Cash flow statement reporting is a leading cause of company financial restatements. 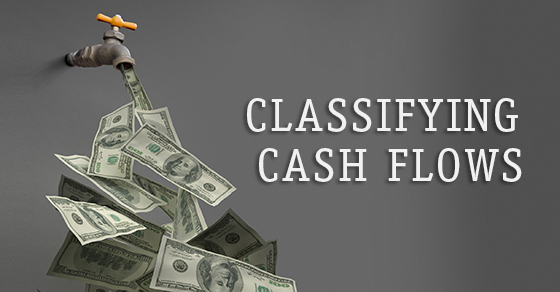 Do you know how to categorize items on your statement of cash flows? Accounting Standards Update (ASU) No. 2016-15, Statement of Cash Flows (Topic 230): Classification of Certain Cash Receipts and Cash Payments, attempts to minimize diversity in cash flow reporting practices. Accounting Standards Codification Topic 230, Statement of Cash Flows, provides guidance on classifying and presenting cash receipts and payments as operating, investing or financing activities. Critics say the existing guidance is confusing and, at times, even contradictory. The Financial Accounting Standards Board (FASB) began its work on improving the statement of cash flows in April 2014. The cash flow project was a large undertaking. It wasn’t until August 2016 that the FASB launched the first part of its cash flow project by providing clarity on the following eight issues: 1. Debt prepayment and debt extinguishment costs (penalties paid by borrowers to settle debts early) should be classified as cash outflows for financing activities. 2. Cash payments attributable to accreted interest on zero-coupon bonds (a type of debt security that is issued or traded at significant discounts) should be classified as a cash outflow for operating activities. The portion of cash payments attributable to principal should be classified as a cash outflow for financing activities. 3. Cash payments for the settlement of a contingent consideration liability made by a business after it buys another business should be separated from the purchase price and classified as cash outflows for either financing activities or operating activities. (Contingent consideration is typically an obligation to transfer additional assets or equity interests to the former owners of the acquired business if certain conditions are met.) Cash payments up to the amount of the contingent consideration liability recognized at the acquisition date should be classified as financing activities. Any excess should be classified as operating activities. 4. The proceeds from the settlement of insurance claims should be classified based on the type of insurance coverage and the type of loss. For example, a claim to cover destruction of a building would be classified as an investing activity, while a claim to cover loss of inventory would be classified as an operating activity. 5. Proceeds businesses receive from corporate-owned life insurance (the insurance policies they take out on employees) should be classified as investing activities. 6. Distributions received from equity method investees should be presumed to be returns on the investment and classified as cash inflows from operating activities, unless the investor’s cumulative distributions received (less distributions received in prior periods that were determined to be returns of investment) exceed cumulative equity in earnings recognized by the investor. When such an excess occurs, the current-period distribution up to this excess should be classified as cash inflows from investing activities. No solution was provided for equity method investment measured using the fair value option, however. 7. For beneficial interests in securitization transactions, the updated guidance proposes two changes: 1) Disclosure of a transferor’s beneficial interest obtained in a securitization of financial assets must be classified as a noncash activity, and 2) cash receipts from payments on the transferor’s beneficial interests in securitized trade receivables should be classified as cash inflows from investing activities. These types of transactions are common for financial companies, large retailers and credit card companies. 8. Topic 230 acknowledges that it’s not always clear how cash flows should be classified, especially when cash receipts and payments have characteristics of more than one type of activity. The updated guidance clarifies that the business should look at the activity that’s likely to be the “predominant” source of cash flows for the item.